New exciting workshop in oil! 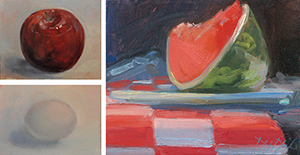 This really fun and informative workshop will cover the basic principles of oil painting and get you painting simple and easy to understand objects in a short time. The idea of this workshop is to get you comfortable with the process of painting while teaching you how to paint dynamic and exciting paintings. The class includes interesting and memorable discussions on all the basic elements of painting including, composition, massing, building form, light and shadow - and depending on your own style, knowing when a work is finished (learning how to not overwork your painting). 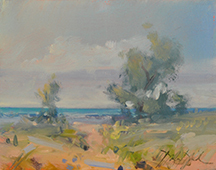 Douglas delivers sound principles of painting that are an incredible foundation for your painting, and whether a person who has never ever picked up a brush, a relatively new painter or a more accomplished painter looking for some strong points to review, it will make sense. Students will work in their own style/technique so that the finished work is their own. Students will paint simple still lifes which usually includes items like apples, eggs and really common and fun things like donuts! 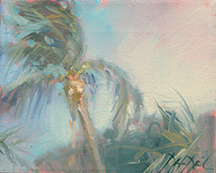 You will also paint from a photo to help you get the idea of what painting “en plein air/out of doors” is like, usually we paint a palm tree, a beach and sometimes a sailboat. Depending on the skill level of each student, students are able to grow and develop at a rate that is to their comfort. Plan to produce a few small paintings and possibly one larger painting. Plan to bring notebook/sketchbook and enjoy all the demos along with some great stories to help you remember these principles that are the foundation of Douglas’ teaching. Douglas will offer “BASIC PAINT KIT” which includes all the basic oils, brushes, palette knife, palette and canvas panels and medium for those who do not want to buy these supplies individually. You would need to bring some paper towels and rubber gloves. Price $150., while supplies last. Please reserve your kit when registering. Day 2 1st half hour: Overview/Review Specifics. Last hour: Select and display various paintings accomplished / a small class show with discussions and summary by Douglas ends workshop on a very high note.